This East Coast Stallion Incentive Fund horse and Bailey are ready to rock the house. Springfield is a great location and pen for this team. They are ready to run against the best of the best and make her grand parents prouder than they already are! The Best of the Best will be shining bright with the Qualifiers for 2014 – Read a little about them and what they have to say about their horse, favorite arenas and the people who inspire them the most. What are the bloodlines of your horse? His breeding is Sunfrost Bronsin, PC Bronsin, Sun Frost, and On the Money Red. Can you name one or more people who inspire your riding? My grandpa, Jim VanTilburg, inspires me! He takes me to every show, pushes me to do my best, and supports me in all my decisions!!! What is your best memory of you and your horse as a team? My best memory would be when I ran Sparky for the first time and we won the open! It was at Springfield on November 17, 2012, just a week after I bought him. What is your favorite arena and why is it the one you like the most? My favorite arena is C bar C arena in Cloverdale, Indiana. I like it because the ground is always really nice and the people are very nice! They also have nice stalls and a big make-up arena! How long have you had the horse you qualified on? I will have owned Sparky for 2 years on November 10th. Do you have a favorite song you like to hear before you enter the alley way to make a run? My favorite song to run to is Black Betty by Spiderbait. I like it because it is really up-beat and it gets me pumped up for my run. 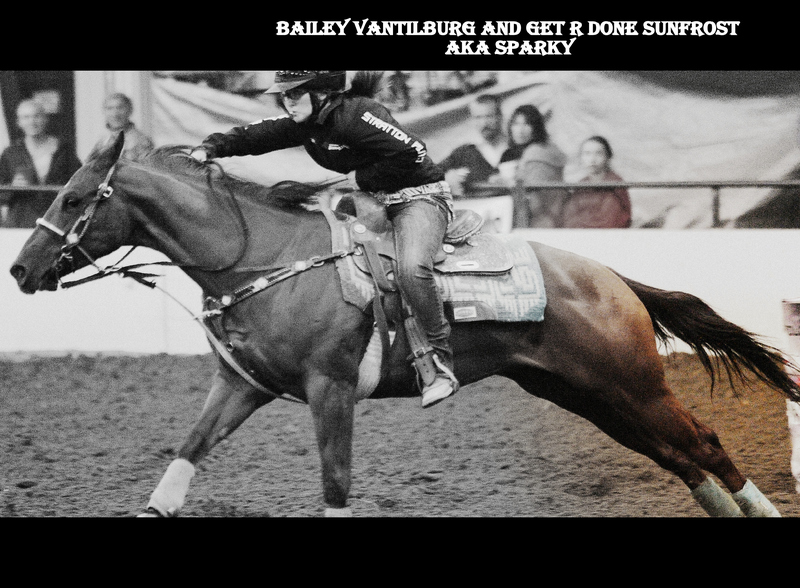 Watch for Baily and Sparky (Get R Done Sunfrost) to run up the alley way at the Best of the Best! Previous Val Watson and JuneBug and Seis So Sweet are ready to be heard! Next Team Marley and Evan’s Cause Auction will have lots to try to win!